You can view orders and create new orders on behalf of the buyers. While many customers will use your sales channels to create orders, they can also come through other sources such as phone calls, emails or contact requests. Marello makes it easy to manually create orders for customers. When creating an order, you can create new customers or select existing customer on the fly, add products, configure shipping options, and more. 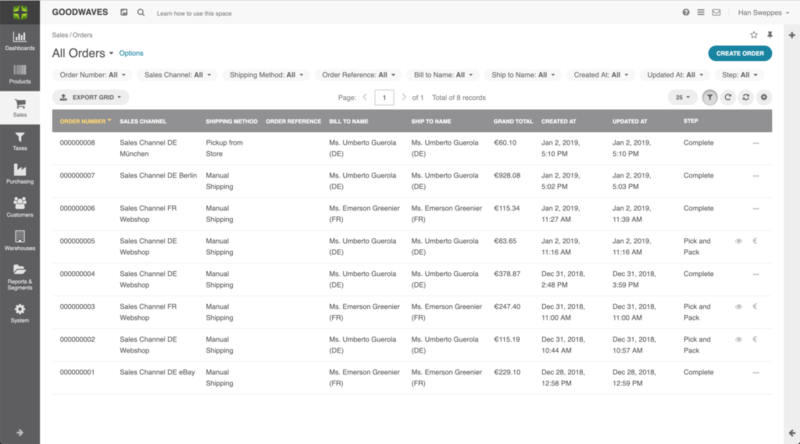 Get an overview of all orders in the system. Navigate to Sales → Orders → Click on an order. 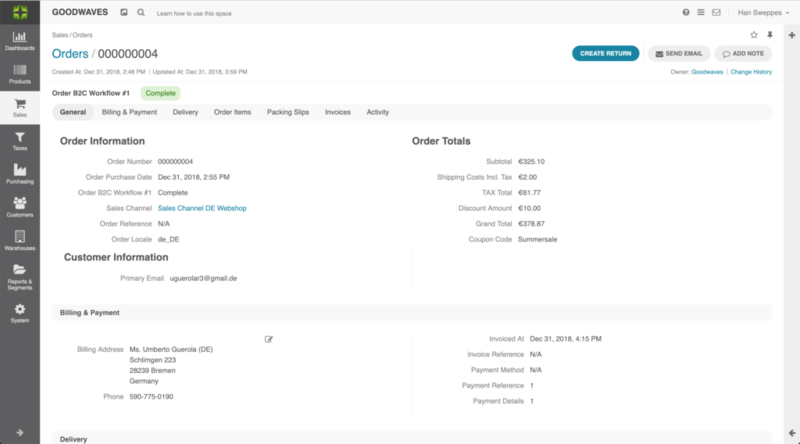 By clicking an order in the order overview, an order ‘view’ page will open. The VAT is calculated based on the shipping address. After receiving or creating an order, a workflow will be activated. The workflow is predefined by the user in the system configuration. Orders are processed based on workflows. Multiple workflows can be created and attached to orders, where each order has one unique workflow. By default, Marello is installed with a B2C workflow (Order B2C Workflow #1). The workflow linked to the order ensures that the entire order is handled in line with the different steps and goals of the process. Going through the Order workflow can be done manually by clicking the workflow buttons in the top right corner of the order view page. Alternatively, the workflow can be automated when triggers are integrated. Click on the ”Create Order” button in the top right of the screen. Search for a product in the product list, by typing in the name of the product or use the product list. Shipping Options: Select the appropriate Shipping method. Available shipping methods vary based on integrated shipping methods. Override Shipping Cost Amount: You can overwrite the shipping cost by entering alternative shipping costs.